ALREADY BUSY: The bus counters are already packed with people making seat bookings. KUCHING: Express bus tickets have been selling like hot cakes the last few days, and only a limited number of seats are left for trips starting Aug 16. With many expected to `balik kampung’ for the coming Hari Raya holidays, the tickets are expected to be sold out anytime this week. A Bus Asia ticketing staff, Fellyana Sibah, 22, said tickets for the Kuching-Sibu-Bintulu- Miri trips for August 16 and 17 had been fully booked. If there are a lot more bookings coming in, she said Bus Asia might have to increase daily trips from the present nine to 12 or 13 during the Hari Raya celebrations. “As of now, Bus Asia has yet to decide on providing the extra trips. But usually in this case, the company will provide additional two to three more trips. “As for ticket prices, there have yet to be any price hike even though the bus operators would be handling so many seat bookings when compared to those on ordinary days,” she said. Meanwhile, Bintang Jaya ticketing staff Edwin Nikom, 30, also said the company’s fleet of express buses were almost fully booked for trips starting on Aug 15. Because of this, he advised those who had made plans to travel by bus during the Hari Raya period to make bookings now to avoid last minute rush hassles. Asked about ‘ulat tiket’ (touts), he said there had yet to be such problems in Kuching, especially at the new bus terminal in Kuching Sentral. 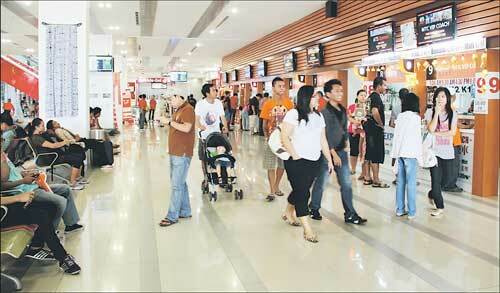 He reckoned this was due to the systematic ticketing at Kuching Sentral which made it difficult for touts to operate. “All the bus operators are keen on taking care of their respective reputation, so touts will not be able to operate here,” he said, adding that Kuching Sentral was expected to be packed a week before the Hari Raya celebrations.